Our newly renovated Boardroom features a large table and a 60” Smart TV. 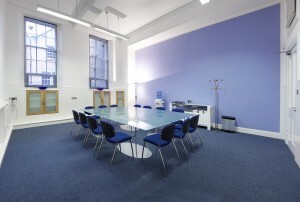 This elegant room can hold up to 14 delegates in boardroom style and 30 in a theatre set up. The helpful staff at Capital Business Centre can take care of any additional requirements you may have, such as catering, audiovisual and IT equipment hire and our meeting rooms have free WIFI. Our excellent location in the West End of Edinburgh’s City Centre has us situated on all main transport routes. Only minutes away from Haymarket Station and Princes Street, and a short bus ride away from Edinburgh Airport, our building is very accessible. We also have an Interview Room for your smaller scale meetings, of up to 4 people. Please use our online booking form to book your meeting room. Simply specify how many people will be in the meeting, how long you want the meeting room for and your preferred date. 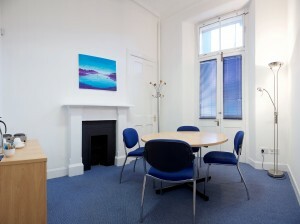 Or if you require more information about our Meeting Rooms please contact us.